Tonight was the opening for the fiber themed show at the Boatworks. My piece is hanging on the back wall of the back gallery. People have liked it, though many have been surprised by it, as it is not typical of the work I have shown there. Of course, I have only been showing there for the past seven years. Above is a close up of my piece, and below it can be seen on the wall, toward the left side. The show remains up at the Boatworks through September 26th. Admission is free. I continued work on my shipping box around other commitments on Thursday, and then finished it today. With the inner box finished on the first day, the rest was pretty easy- essentially wrapping the first box with an identical piece of cardboard, gluing and taping as I went, and then cutting all the flaps. Plastic sealing tape in key spots was dealt with this morning. 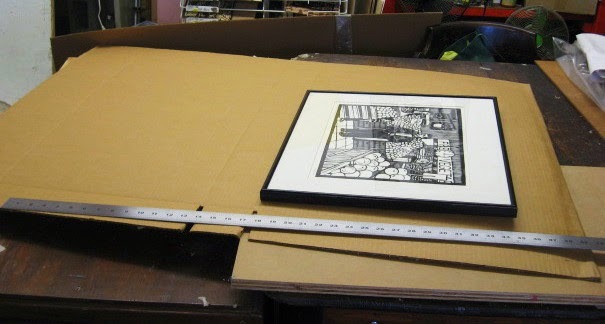 Above, the completed box that can hold two framed supermarket prints. I figured what would make this easiest for my contact would be if I could just get a prepaid sticker for the return trip, but my shipper thought there would be too many possible complications. So went with plan B, weigh the box with two framed works in it to find out the fee for shipping that from one point to the other, then put the money in the otherwise empty box, and seal it and send it up to Newark. Afterwards, I called Steve to let him know it was on the way and what to expect. So how did this compare to the alternative of going to Newark myself and picking it up? Assuming no complications, it would take three to four hours to make the round trip. Somewhere around $30 for a round trip train ticket if I went that way, and about the same in gas, tolls, and parking fees if I took my car. The box took about 5 hours of my time total over the three days, and other than a negligible amount of glue and tape, used just stuff I had in stock. And as for complications, yesterday I caught a bit of the noon news, where there were covering a car chase that had left some destruction and a lot of blocked off streets in Newark, centered on University and Market. That happens to be about a block from the gallery, which would have created all kinds of crazy traffic, and it's bad enough when nothing is going on. 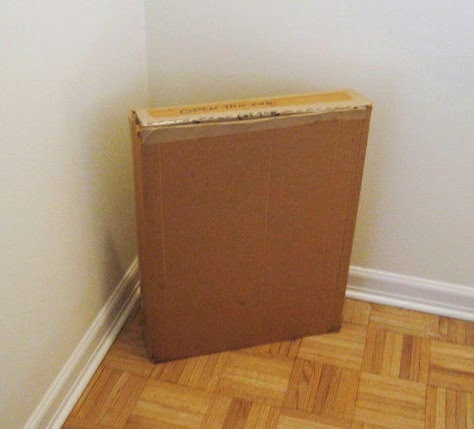 Receiving my art in a timely and secure fashion will be the final test of how well the shipping worked, but so far that seems to have been the better call. Experienced artists (or at least regular readers of this blog) know that an artist's life is full of all kinds of tasks that have little to do with making art, but things we have to do. For example, the recent print show that I was in in Newark is over, but for various reasons, this is not a good week for me to go up there to pick up the pieces. So I made arrangements with the organizer to ship my works back. He agreed assuming I did the all the work of preparing the shipping means, and that's fair, since it's a lot of work. I began the process this afternoon. I had a couple of large pieces of single corrugated cardboard, which seem to be pre-cut and folded boxes, and almost the perfect size for the task. I brought those and a sample framed supermarket print to the Studio and took advantage of the big table. I've done enough of these over the years that the process goes quickly. I made a few cuts, scored a few lines to ease folding, and then started the assembly. Wood glue and clamps make the work go quicker. 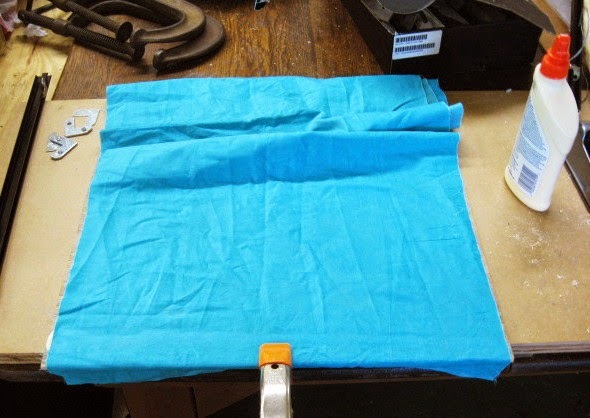 I used some of the old lauan used for last week's mounting and framing job to cut protective and reinforcement panels for the two broad sides, and secured them in place with paper tape (below) I brought everything home to let it dry and continue the process in the evening. On the way home from Ocean Grove, I stopped in Belmar to clean out the stuff I stored there for my most recent class. Being able to keep stuff there over the last month probably saved me an hour or two per week, and I hope it will be available next time. 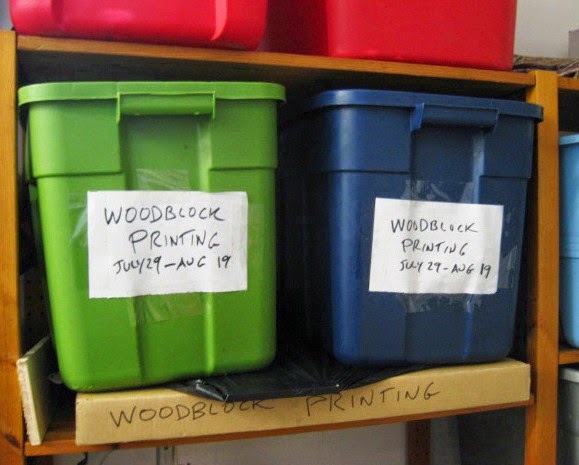 But the next class is probably two months away, so the fair thing is clear out those tubs and make them and the shelf available to someone else with a class in the near future. Tomorrow- finish the box and maybe get it on its way. An unusual day today. Beautiful and sunny, yet the parking areas around the Boatworks were deserted, instead of the typical crowds parking for the marina, etc. We were down to four for our last meeting of this session, and this summer, but everyone came in with work to do and it got done. Sue had missed last week, but was busy cutting and reworking older blocks. She decided to concentrate on printing tonight. On her own she had tried printing with water based ink and water soluble oil ink, and now wanted to try oil based ink, pulling and hand printing three proofs of this cat block from earlier in the semester. The verdict- oil ink is the best, which is what everyone decides. Meanwhile, Stan and Marie concentrated on cutting two newer blocks, hoping to get done as much as possible in our last meeting. Marie did pretty much all the cutting in the above piece tonight. We discussed other places to go from here on this piece, but she was pleased with what was done so far. 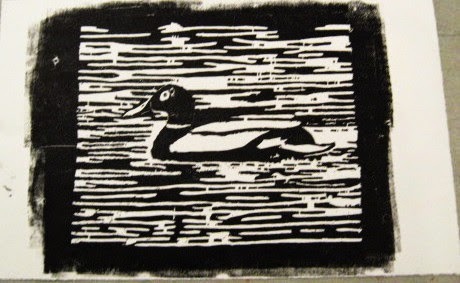 Stan has been working on this duck piece off and on over the past few weeks, but wanted to get a state proof tonight. So far so good. He plans some minor changes to the water's surface, but not much more than that. 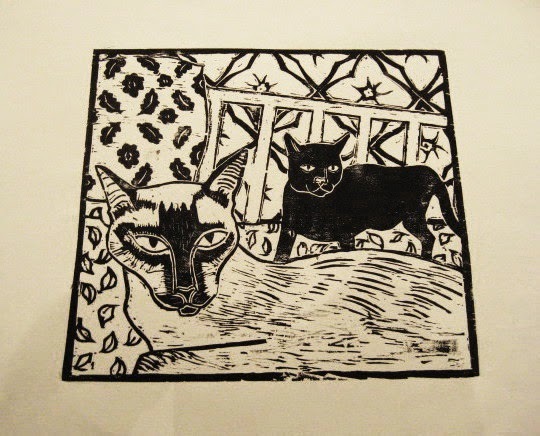 So woodcut is now off for a little while. I'm hoping to get many of the students to participate in the upcoming show of art by Belmar students, and hoping that leads to recruiting new students for an eventual fall session. I decided last week to try Jane's suggestion at the critique group, using some colored cloth as backing for my fibers show print, to make the embedded fibers in the paper more visible. My frequent woodcut student Mary was there, and over the weekend e-mailed me to offer me some fabric scraps she had. 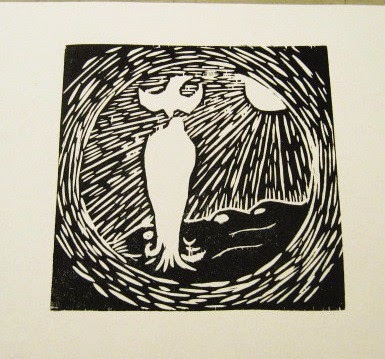 I decided that the easiest time and place to meet would be in Belmar, the night of my woodcut class. This worked for her, too, and so she showed up about 20 minutes before the start with large bags of different kinds of fabric. 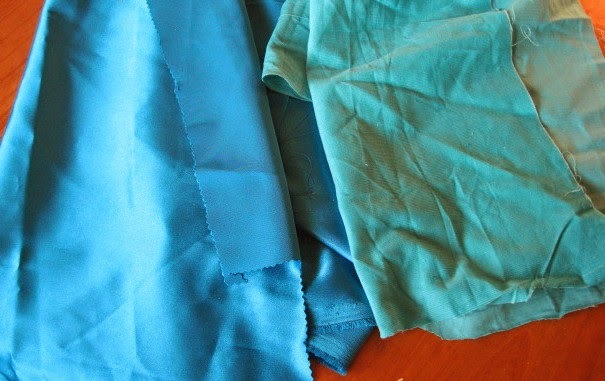 I decided to take two of her scrap pieces, one light blue, one a light aqua. Back home, I tested both pieces of fabric under the print, and decided that I liked the effect more with the aqua piece- both created fiber contrasts, but the aqua added more color. So I took it to the Studio today, and began the process of adhering it to my plywood backing piece. The remnant was almost exactly as wide as my wood (17"), so I started by gluing it along the top edge of the wood, then stretching it across the wood and gluing along the bottom edge. Used wood glue, so it dried quickly. With the fabric secured, next came the print. I'm guessing that not much about the process is truly archival, but I did want to make it reversible, should I have a need to present this print differently. So the print itself isn't glued, but just wrapped around the plywood piece and taped to it with linen tape. 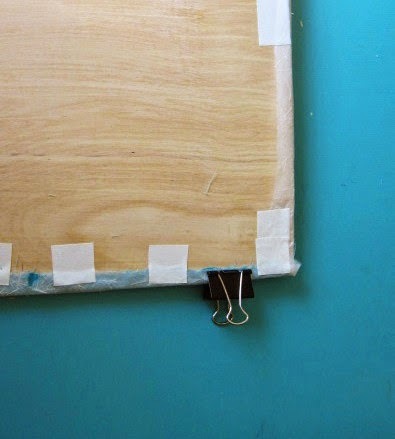 In the above photo, a little of the fabric color can be seen along the bottom edge of the plywood, through the paper pulled over it and held in place by the white tape. It's on top of my mat board folder which just happens to be the same color as the cloth. Once I was sure everything as dry, I slid it into the frame and completed the assembly. In the above photo, the fabric has had the desired effect and made the texture of the background more visible. I set it aside for now, and will deliver it to the gallery on Saturday. 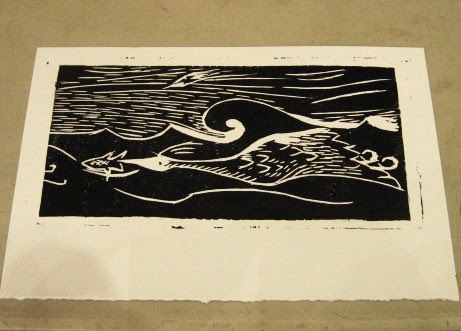 I can't explain why it rains so often on Tuesdays that I teach woodcut, I just know that it does. And it usually starts late in the day, just as I'm loading stuff at home and bringing supplies for class into the Boatworks. Luckily they are letting me keep a lot of stuff in the building now for the duration of my class, so just one trip to load the car, and few things to risk getting wet. Rain all around the state most of the day, though very little in the shore area until around 5 pm. The result was an overabundance of parking around out building. My student with the longest trip down had informed me that she couldn't make it, but the other four all showed and it was another busy night. 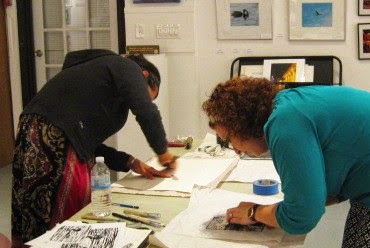 Above, Dawn and Lauren spend the night printing their blocks, pulling many usable proofs. Dawn had pulled a decent proof of her octopus block last week, but today came with a supply of scrapbook paper in a variety of designs (an option I had mentioned in week 1) and after making a few modifications from last week's block, printed half a dozen all different from each other. Above are the first three proofs. 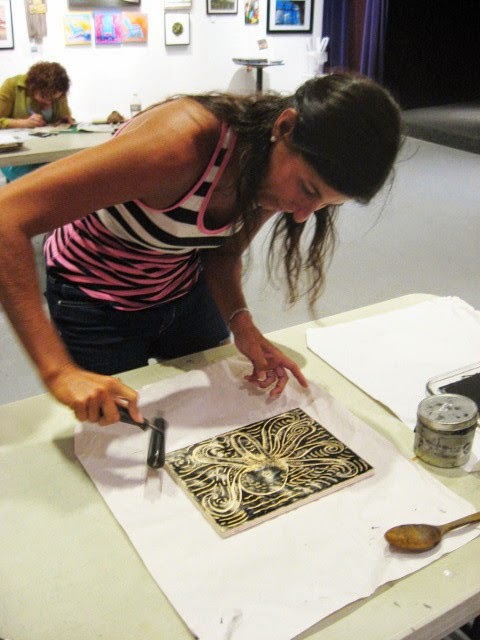 Marie requested a new piece of wood and started cutting, but toward the end of class put that aside to pull two proofs of her block from last week. She put these on a heavier print paper than last week's test proof, with the intention of going back in with watercolor. The trickiest thing for everyone was figuring how they would get all their new prints back to their cars without them getting overly wet from the rain. Sadly, just one more meeting in the current series and then we take a break while my college schedule is sorted out. 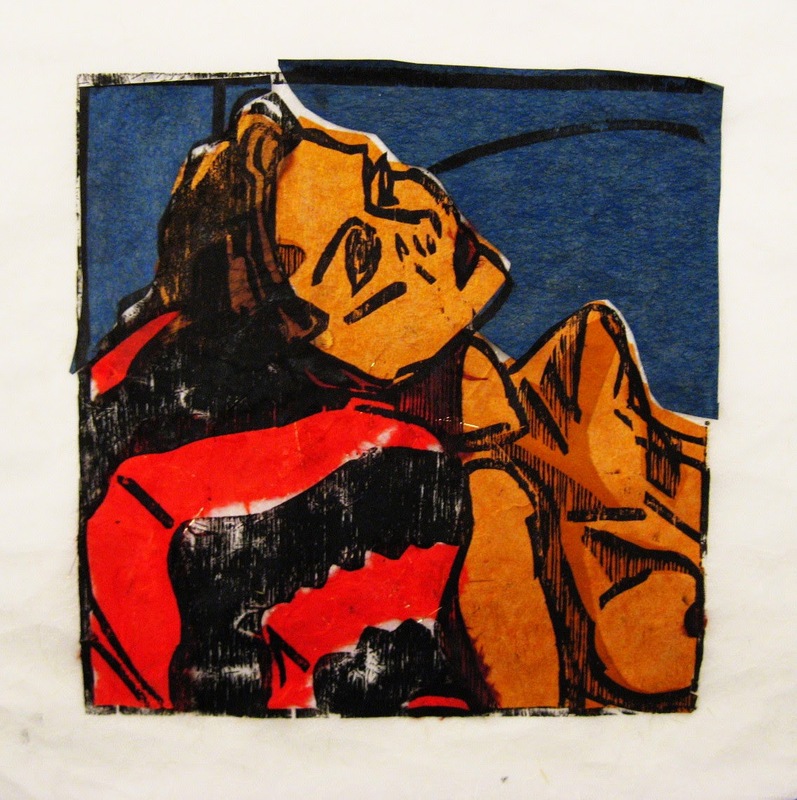 but I expect that some of my students will put prints in upcoming show of work from participants in BAC workshops. 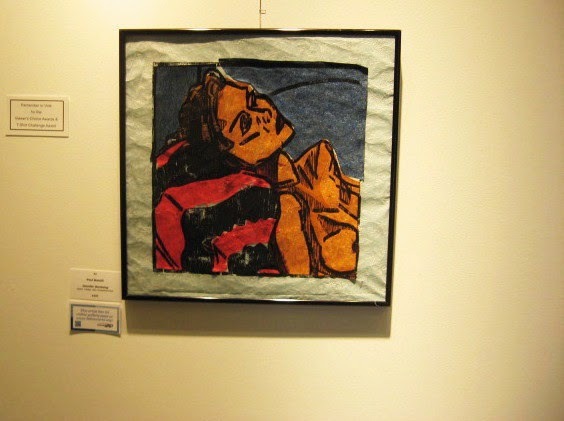 A week from today I have to deliver my Fiber Art piece to the gallery in Belmar. The print is done, but now I have to figure out how to display it. I have a bunch of 17" frame pieces, a good size for the project. Due to the nature of the piece and focus of the show, I don't want to put it behind glass, so I'm just planning to mount it on a board that will be held in place inside the frame, which will be wired to hang in the show. I brought the print to the critique a few days ago, transporting it in a mat board folder, and clipping to the folder so I could lean it against the wall to be seen. The piece of kinwashi that I used for the backing piece is translucent, like a thick piece of tissue paper, but with embedded fibers. With something white behind it a viewer might just see a little texture, but with something colored behind it, the little fibers stand out against the background (the mat board folder was blue). In the critique, it was suggested that I mount it on a piece of colored fabric, which would have this effect while continuing the theme of the fiber show. 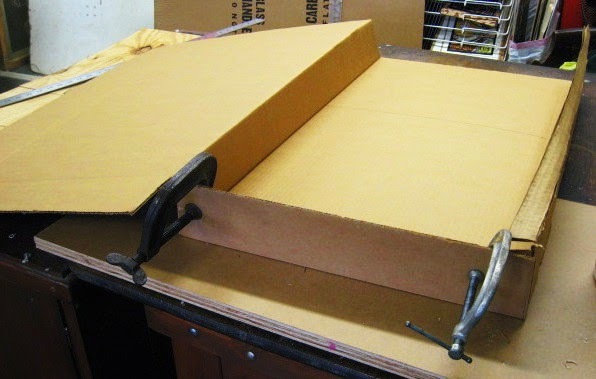 I will look into that next week, but for today I wanted to prepare some kind of backing board. 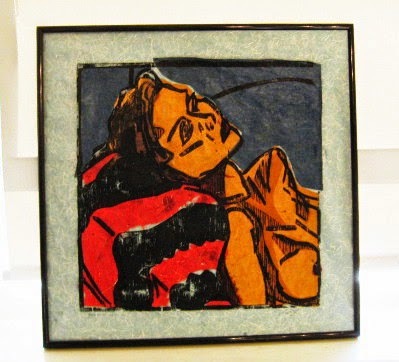 In the Studio I had a few 4 foot square pieces of quarter inch lauan, which had been behind cabinet. The dampness of the basement had caused them to warp a bit, making them unsuitable cutting into large blocks, but smaller pieces can and will be used for various purposes. The sheets of plywood were pulled out of their storage space during the flood clean up earlier this year, but not damaged. It's about time I put them away, but before doing so, I clamped one to my work table, and measured out a 17" square, then cut it with my saber saw. And then I cut a second one. Don't know that I'll need both, but it was simple to do it while I was set up. 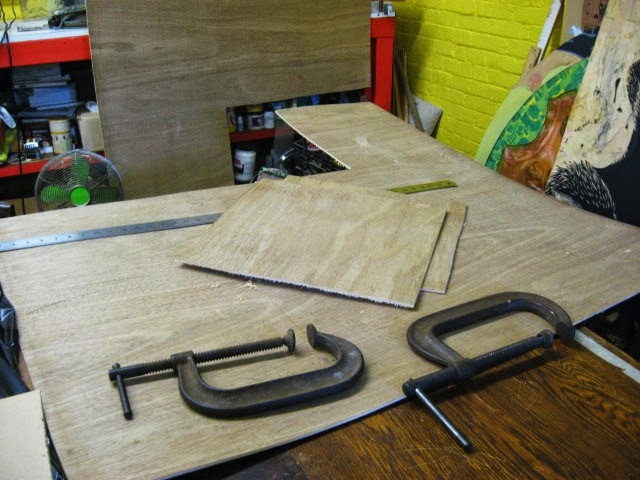 I stashed the big plywood back where it had been, and left my cut pieces on my table for now. I'll come up with an official plan early next week. Due to some complications in Molly's schedule, she wasn't available for the critique on Monday of this week, but she decided she could do it tonight. We put the word out and several people were able to make it on short notice, giving us a decent crowd, including a few people we hadn't seen in a while. Other than a particularly obnoxious rendition of "My Way" being rehearsed repeatedly in the space above the cafeteria (where we were holding it) it was a pretty good evening. 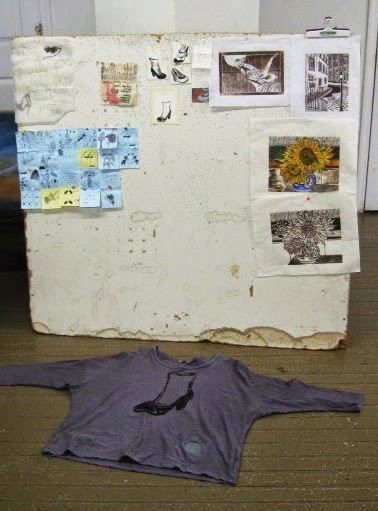 The photo above has some prints from Mary, the little shoe sketches that Molly showed a few months ago, plus one of those shoes screened onto a t-shirt, plus some post-it note doodles from TJ. 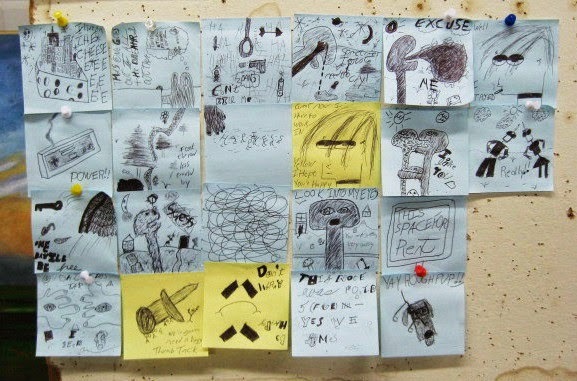 Below is a close up shot of some of those doodles, a product of an overnight job, something I have some familiarity with. Jane hadn't been around for several months, an effect of living on the other side of the state, but she's been using that time to work on art. Above are various paintings in progress. Edy has also been absent for a while, and also traditionally keeps busy with art year round. Below are two paintings of hers. 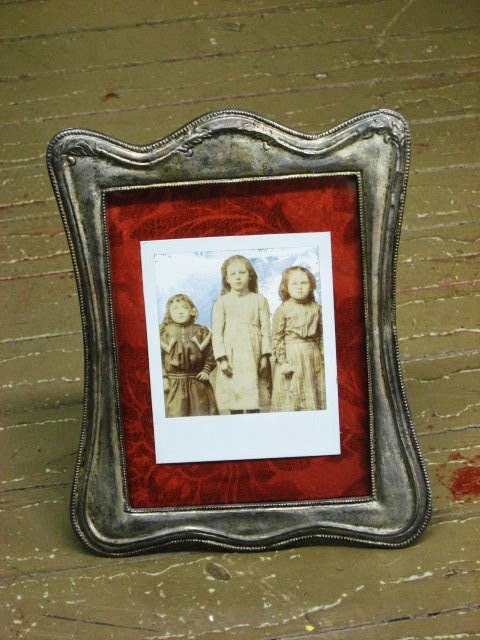 Christina (friend of Molly's who comes a few times per year) showed a large collection of vintage photographs that she had collected, some of which she has manipulated to create art, as in the framed example above. She has lots more planned. Not surprisingly, I brought my freshly printed collage piece. It got a very good response- people being shocked that I had made it, though for me it's a reworking of a 20 year old project. I got some suggestions for how to mount it, and I will consider these since I didn't really have a plan yet. With a group of students ranging from a few to several weeks into the process, I had a bunch of people excited to print, making for a frantic night. I decided to go with three tables tonight- two for people to cut blocks at, and one just for printing. While waiting for the 5th student to arrive we took care of other business- distributing more wood, evaluating work in progress, general advice. My piece that I'm putting together for the Belmar fiber themed show would work as both a lesson in chin colle, but also be a jumping off point for a talk about the pros and cons of different kinds of ink. I did the demo and completed the piece as planned, and with the leftover (oil) ink, two students printed their first blocks. This birch plywood prints up nicely, both getting decent proofs on the first attempt, and both pleased with the results, though both thinking about using color to improve the impact of the pieces. The other three students continued drawing and/or cutting on blocks they had, and I'd be surprised if they're not all ready to try printing next week. 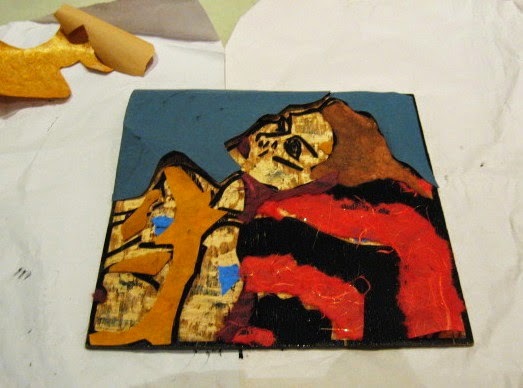 The next step was to brush some glue onto the backs of all pieces, especially those on the skin. 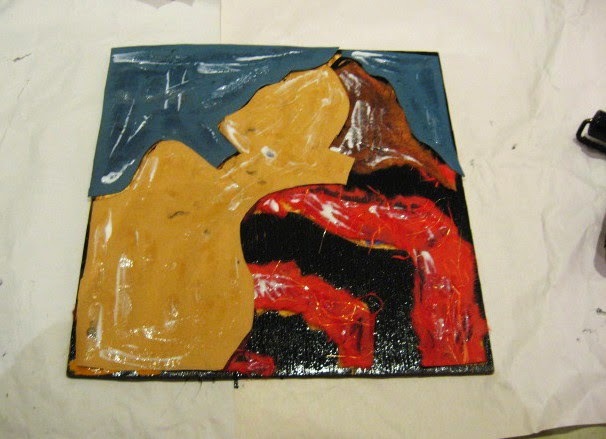 I placed the largest color piece (skin) on top, and then more glue on top of that, and on everything else. I had torn a piece of kinwashi to the right size to be the backing piece, put that on top, then a piece of newsprint to protect all that as I printed. Above, the completed piece. Some of the blue shifted a little bit, but I'm fine with that since it emphasizes the paper nature of this piece over the print content. I had to reglue a few pieces as I was lifting it off, but it all came up as expected. 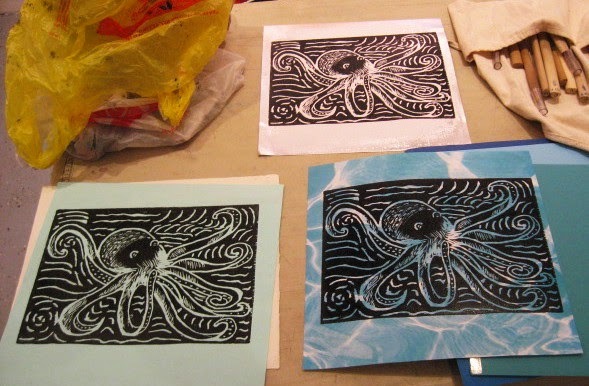 The class was impressed with how it turned out and some are considering ways to use this process in some of their own prints. Meanwhile, I'll submit it to the Fiber show in Belmar tomorrow (online w/photo), and it will be dry before I'd have to bring the actual piece two weekends from now.